Dr. Seuss writes some excellent books. Blue Sky Productions (those guys behind ‘Ice Age‘, ‘Rio‘) makes some pretty good animated movies. Put the two together, and you end up with the thoroughly decent Horton Hears a Who! Horton Hears a Who! 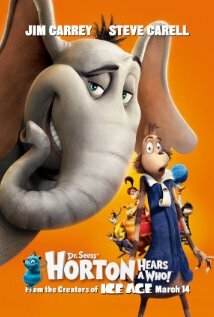 tells the story of Horton (voiced by Jim Carrey), who, incidentally, hears a who of the town of Whoville, that happens to live on a speck. He has to keep away the speck from evil kangaroos and crazy-lookin’ monkeys, and go out of his way to bring it to safety. That is the same Whoville of How the Grinch Stole Christmas. The message at play here is that everyone has a voice, no matter small. 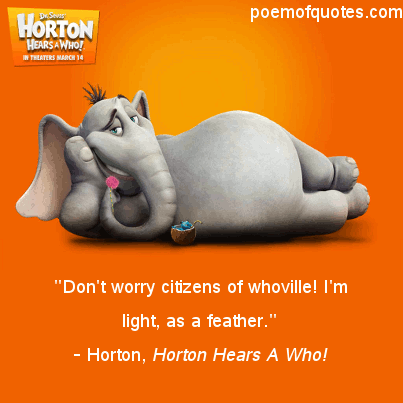 Horton constantly communicates with the Mayor of Whoville voiced by Steve Carrell, a comedian with an equally big voice, as the message might suggest. You’ll want Horton to get that speck to the mountain and be safe. But you’ll forget half of the names of the citizens of Whoville the second the end credits roll. While the movie isn’t ground-breaking, it has some nice animation that fits the imagination of Dr. Seuss. 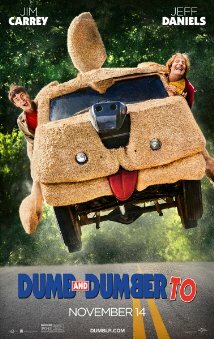 Jim Carrey is over-the-top as Horton, but he’s just being his usual self. His voice acting will make this entertaining for older audiences, as well as children. Some of his impressions will leave children in the dark about the real joke, because they’ll only be thinking – “Oh, he’s talking in a funny voice. That’s supposed to be funny. Ha-ha!” I’d rather him stick to live-action movies. He does some spot-on impressions, but for some viewers, he could take away from the story. 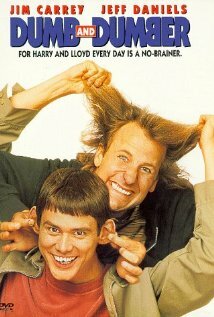 Jim Carrey and Steve Carell are the stars of the show. As is the animation. The story’s lightly written. 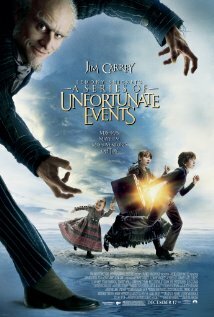 It’s forgettable, but it offers some good entertainment. It’s one of those great movies for a rainy day. You can relax and watch it, and just have a good time. It’s nothing more, but it’s nothing less. It’s definitely better than Dr. Seuss’ The Cat in Hat. Truman Burbank (Jim Carrey) is a friendly and charismatic simpleton. He’s also the star of a reality show that he was born into. The show he’s on is the most popular show in the world, The Truman Show. It’s a 24-hour drama that chronicles his every move. Everyone that he thinks are his friends is really just actors put there for the show; and Truman is the only genuine person in the fictional town of Sea Haven that he calls home. Once Truman starts to wonder if there’s something going around this town, he really just wants to get out and explore the world. Though, Truman has never been that exploratory after an incident that caused a phobia of water; a childhood experience when he and his father went out to sea and they were attacked by a thunderstorm and his dad fell off the boat and supposedly drowned. 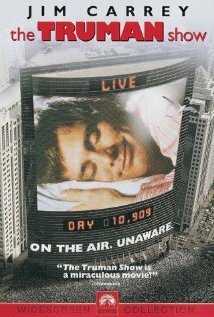 The Truman Show is actually such an original and intriguing plot. The character that is Truman Burbank is so simple too, that you can’t help but sympathize with the guy. He is probably one of the most intriguing characters since Forrest Gump. The film uses the aspects of drama, comedy and fantasy which make such a wonderful blend. The Truman Show is an interesting and entertaining ride that cannot be missed. It also has great performances from a lot of the cast. The only thing that I did not like about the movie was the fact that Truman’s wife was quite annoying and fake. Granted, in a way it was good that she was extremely fake. I guess the film’s only flaw was that it was a little slow in some areas. The film is directed wonderfully by Peter Weir (Dead Poets Society), written by Andrew Niccol (Gattaca), stars Laura Linney as Truman’s wife, Noah Emmerich as Marlon, Natasha McElhone as Truman’s lost love, Lauren; Holland Taylor as Truman’s mother, Ed Harris as the show’s creator, Christof; and Paul Giamatti as a Control Room Director. 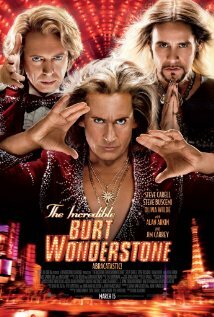 This film is an absolute treat, with a magnificent performance by funny man Jim Carrey in a great dramatic role.